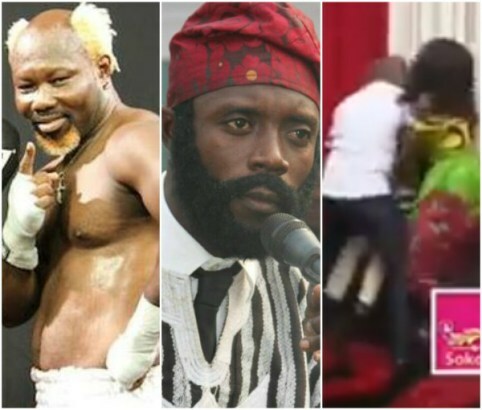 An interview at an Accra-based TV station went sour, as Ghanaian boxer Ayittey Powers and popular comedian, Baba Spirit, fought after the comedian dissed his hairstyle and also made some ‘insensitive’ jokes about him. Ayittey Powers, born Micheal Ayittey Okine, turned up at the studios as a guest for an interview alongside Baba Spirit who was also on set as a co-guest. However all of a sudden, Ayittey Powers became angry, got up and started beating him. “IF I KNOW LIKE YOU PEOPLE WILL INVITE THIS GUY, LIKE I WON’T COME,” BUT BABA SPIRIT REPLIED HIM….”WHAT CAN YOU DO” AND THAT RESPONDS GOT THE BOXER IRKED. THIS IS HOWEVER NOT THE FIRST TIME GHANAIAN BOXER AYITTEY POWERS AND BABA SPIRIT HAVE ENGAGED IN A BANTER. IT WAS GATHERED THAT IN JULY 2017, THEY CLASHED IN THE STUDIOS OF AN ACCRA-BASED FM STATION. BABA SPIRIT HAD MOCKED AYITTEY POWERS AFTER HE LOST WOEFULLY TO BUKOM BANKU IN A FIGHT, AND EVEN WENT ON TO SAY THAT AS SLIM AS HE IS, HE COULD EASILY BEAT POWERS TOO. HE ALSO ASSERTED THAT AYITTEY IS SO WEAK THAT EVEN HIS WIFE BEATS HIM. THIS REALLY INFURIATED AYITTEY POWERS, WHO WARNED BABA TO BE VERY CAREFUL OF HIM. PERHAPS, BABA HAD NOT BEEN CAREFUL ENOUGH, OR MAY BE HE HAD FORGOTTEN THAT STERN WARNING, RESULTING IN HIS LATEST BEATING. BUT SOME FANS HAVE CONDEMNED AYITTEY POWERS ACTIONS, WITH SOME CALLING FOR HIS ARREST.